No doubt in your planning of your relocation to London your mind is full of questions as to what you should get in your home country that may or may not be available here. As you know the dollar is weak against that of the GBP sterling, so in fact there are a few things that you really want to consider bringing with you before your international relocation is permanent and you’ll be relying on others “back home”, to send you what it is you crave. Now I’m not speaking right now of food stuff’s for certainly there are American and Canadian brand food items that you CAN buy in England, albeit they are FAR more expensive, but that is a common thing. For instance, when you started working with your relocation services company and your relocation agent began sending you flats and apartments you must have been amazed at some of the lease prices for such small spaces. Yes rents can be shocking when your first working with your London relocation agent, it’s not the standard North American sized places you’ll be seeing. Paying 2,100 GBP a week in rent in places like we discussed yesterday, Kensington area is not uncommon. As a side note, that equates to $3,400 USD for all you Americans moving to London and $3,346 CAD for all you Canadians moving to London, oh yes, and that was a weekly price don’t forget. Certainly there are rents to be had that are more reasonable, and your London relocation agent is just the person to speak to about it. Let them know your price range and start by seeing properties in your price range. But you may want to be prepared to increase your budget when you see the size of London apartments. So what is it that you can get back stateside that you will really pay through the nose to buy in England? Well jeans for one. Let’s take that all American Jean Levi’s. I priced a pair of 501’s around town and they are asking approximately 75-90 GBP for a pair of ladies boot cut jeans, which equates to $113-$145 USD, for a pair of Levi’s! It’s about the same in CAD, $111-$143 for our Canadian expats. 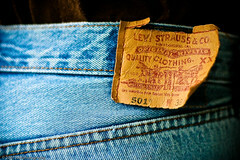 So you see some absolute basics, and I do consider Levis as a basic, can be really quite expensive. Periodically I’ll continue to update you with items you may want to stock up on while still back stateside, but for now let your planning your relocation be about where you’ll live instead of what you’ll be wearing.